Hello to all of our followers. We've been absolutely delighted that so many of you are interested in the story that we're set to tell, thank you for making this so worth while even in the infancy of our blog. Today I visited my new vehicle at the garage! A big step as it'll be the one we take on our SMAll adventure around Europe. So I thought that I could write an entry specifically about driving from a wheelchair, and how my current vehicle is adapted for me to drive independently. Firstly I'll admit, I actually haven't been driving for 5 months prior to this post, as my current vehicle has faced a number of problems! I'm going to be honest, the complexity of the adaptions and technology that these miracle machines contain means that when they go wrong, they go wrong in a big way. My Renault Kangoo (I like to call her Amelie!) was adapted for me 6 years ago through the Motability scheme, and they suggest that you change vehicles every 5 years. Not wanting to scrap a perfectly decent car for something shiny, I opted to extended the lease for another 2 years which is the maximum lease contract time. However, what I hadn't considered was the age and efficiency of the technology on board. With the final year of my lease approaching, I applied for a new, larger vehicle which would suit my lifestyle more (with a 6ft+ boy, a PA, and a labrador in tow..) and excitedly attended the assessment at a Motability approved garage, which coincidently was only 10 minutes from home. On leaving the assessment, my Kangoo decided enough was enough and didn't want to be replaced, and the control system failed, showing unknown error codes dating from 1936. The computer that operates the hand controls had died and so it wasn't safe for me to drive with the intermittent fault, especially if I was to drive on a motorway and the system cut out. In all fairness, I wouldn't trust a 6 year old laptop to perform efficiently, so why would the car system be any different? It just wasn't worth the risk of being in a car accident. Please note that this is an extremely rare occurrence and the error codes baffled the local specialist garages and the affiliated garages worldwide, who were contacted in hope they'd have a spare part. The problem was that not long after the system was fitted in my car, the technology was significantly upgraded from analogue to digital and therefore the parts needed were no longer in stock anywhere 6 years down the line. So my lovely David has stepped in ever since and has been my main chauffeur in the evenings and at weekends when he hasn't been working. He's able to drive my car with a steering wheel which attaches on when I'm not in the drivers seat, and a chair clips in too. It's a normal automatic vehicle, so it's quite easy for an able bodied person to drive it. 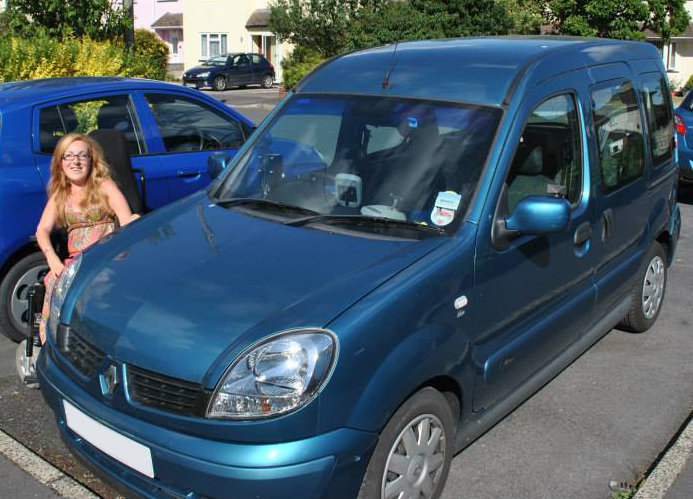 My beautiful Renault Kangoo. 30,000 miles of fun and adventure. I'll miss her! 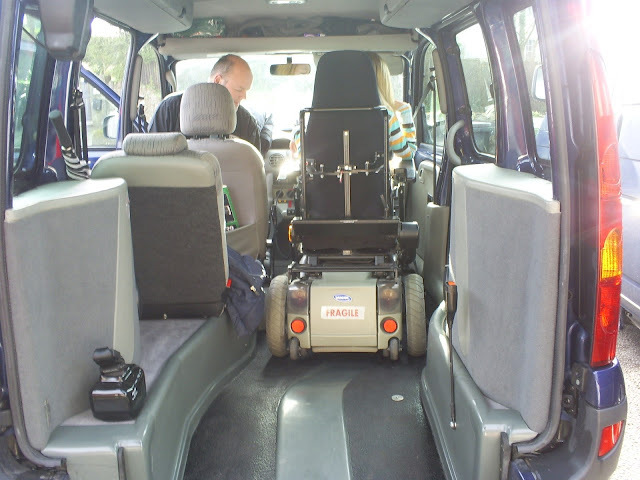 Here's a photo taken from the rear of the vehicle so you can see how easily I drive up the back and into position. I simply press the unlock button and the hydraulics lower the rear of the vehicle, the tailgate swings open and a small ramp lowers for me to enter. There's a lock down system where I park in the drivers position, where a bolt is attached under onto my wheelchair and it docks into an EZ-lock device to secure my wheelchair. The seatbelt is already in position as I drive into it. As you can see above, I can also travel as a rear passenger when someone else drives (if I give them a chance that is!!) and use a locking strap to secure the chair to the floor. The adaptions for the electronic tail gate, access ramp and lowered suspension, and custom made-to-measure flooring adaptions were executed by Sirus Automotive. So are you ready for the exciting bits, the gadgets? 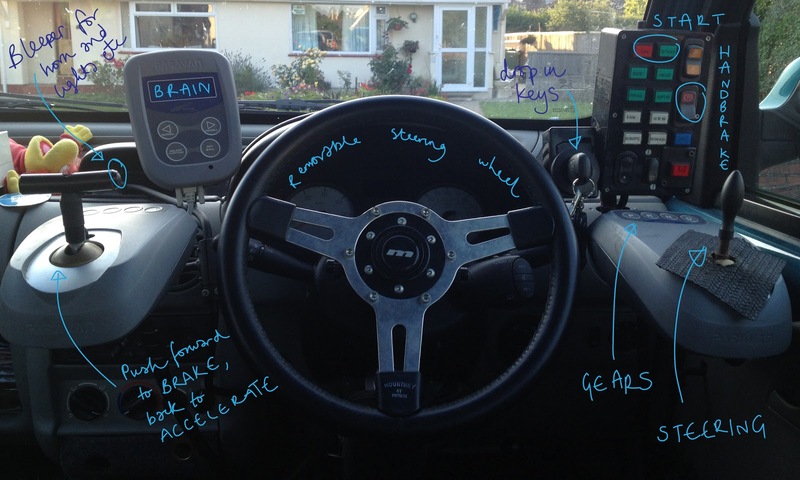 Here's the complete set up I use to drive independently, although I have the steering wheel removed when I drive the vehicle. I use a Paravan Space Drive system, with a brake & accelerator on the left joystick and a steering joystick on the right. The bleeper on the accelerator joystick operates the horn, indicators, lights and wipers, and the control panel on the right has all of the other functions. I simply drop my keys into the ignition hole and we're all ready to go on an adventure! These personalised adaptions were adjusted and built around my chair, to my strengths and weakness by Adaptacar. And just because I can't hold in my excitement, here's a bonus photo of my brand new Volkswagen Caravelle Nevada in it's second build stage, taken this morning! I'll post another in depth blog about the new van once I've taken delivery but it's going to be a very similar set up to my Kangoo. Now you can check out my latest blog featuring my NEW vehicle, and even a video of accessing it, featured here! Just as a final note, we have booked our ferry crossing through Brittany Ferries from Plymouth, UK to Santander, Spain for the 4th of May 2014. IT HAS BEGUN! Interesting blog. This is one of my favorite blog also I want you to update more post like this. Thanks for sharing this article. For the wheelchair users, these options will really be much useful. Then there is also the WheelAble shower wheelchair that one can opt for and get smooth transportation option for you. Really an interesting article. But it's very risky. Looking for a driver & vehicle licensing agency licensed by UK govt? Check out DVLA contact number today. My mother is unable to walk and it used to be difficult for her get inside many of the showrooms and restaurants, as her wheelchair cannot climb the stairs. However, I have recently bought the best evacuation chair from Wheelchair-evacuator.com and it has helped me to fulfil the wish of my mother to go out for shopping without any hesitation.